A chronology and timeline of the life of Richard Buckminster Fuller (1895-1983) is detailed on this page. 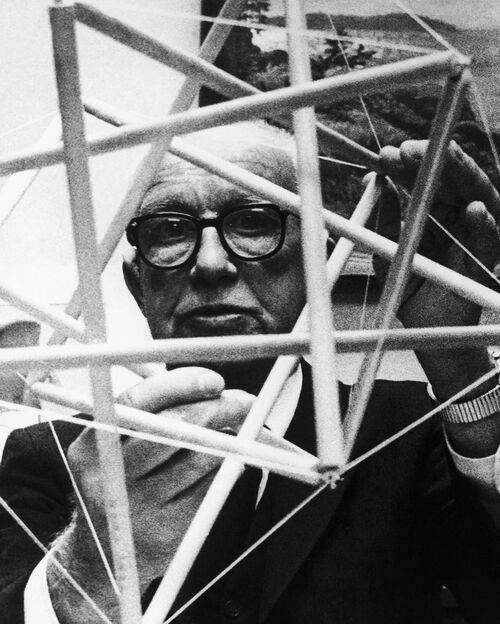 Buckminster Fuller (1895-1983) coined the word 'tensegrity' and was a key figure in its development and promotion. The article relates detailed timelines of events in Fuller's biography. It is intended for tensegrity researchers who are investigating the history of tensegrity, particularly who inspired, designed, constructed and promoted it during its early years. For a biographical narrative (rather than a timeline presentation), see the main article on Fuller, Richard Buckminster or his Great-Aunt, Fuller, Margaret. Fuller behind a tensegrity model." 1904 Begins attending school at the Milton Academy, will graduate 1913. Grandmother Matilda Walcott Andrews purchases Bear Island, Compass and Little Sprucehead Islands, Penobscot Bay, Maine, as summer residence. Bear Island, several miles off the mainland, becomes an important site of relation-ships and experiences for the family. The young RBF builds many model boats and begins to develop his strong affection for sea travel. RBF is aware of a family relationship with Margaret Fuller (1810-50) since he sees her books on the bookshelves, but due to lingering inproprieties and a mixed feeling about how Ms. Fuller behaved, her memory is not honored and he is not made aware of her significance as writer and founder of the American women's rights movement. 1913-14 RBF finishes school at Milton Academy. Studies at Harvard University; expelled. Apprenticeship as machine fitter of imported weaving machines in his cousin's cotton factory in Sherbrooke, Quebec (Canada). RBF keeps a technical sketchbook, in which he reflects on his technical and mechanical learning. 1915 Studies again at Harvard, is expelled a second and final time. Transportation worker, later assistant cashier in canned meat company Armour&Co., New York and New Jersey. Gains insights into the relationship of production, distribution, and consumption; interested in logistics. Meets his future wife, Anne Hewlett. Engagement. 1917 Volunteers with the family boat, Wego, for wartime service with the Navy. Patrols off the coast of Maine. On twenty-second birthday, 12 July 1917, marries Anne Hewlett, the daughter of the well-known and respected New York architect and painter James M. Hewlett. 1919-21 Promoted to naval lieutenant. Commander in the gunboat Eagle 15, built by the Ford Company in mass production. Accompanies Admiral Cleaves to Europe for the signing of the Versaille treaty on the USS Washington. Subsequently resigns from active service, but remains a reserve lieutenant of the Navy. Serious illness of daughter Alexandra. Export manager at Armour & Company. Until company is liquidated, sales manager at Kelley-Springfield Truck Company. 1922 RBF as pilot: flies with Anne in aquatic monoplane by Vincent Astor from N.Y.C. to Bar Harbor, Maine, record time. Journey continues to Bearlsland and Boston. Death of daughter Alexandra by polio. RBF reads Christopher Morley's poem "To a Child," which he will cite frequently later. Takes courses at Graduate School of Business Administration. Co-founds together with his father-in-law, the artist and architect J.M. Hewlett, Stockade Building System, producer of filling material and a patented system of light-construction elements. 1923-25 Stockade Building System continues to grow. By 1927, 240 houses have been constructed along the entire east coast. In 1923, continues taking courses at Graduate School of Business Administration. 1924, Moves into an apartment on East 94th St., N.Y.C. 1926-1929 See detailed timeline below, for details of how Fuller left Stockade in a crisis and started promoting his own concepts. 1930 In addition to the family apartment in Woodmere, Long Island, Fuller rents a space on the roof of the Lehigh-Starret Building in N.Y.C. Designs a Tension Room for Eli Jacques Kahn as a gallery space for Noguchi's sculptures. Numerous one-man shows with the house model and lectures in New York, Chicago, Cambridge, Washington, D.C., etc. Hugo Junkers takes notice of RBF and evaluates the construction of the Dymaxion House. Notices on the industrialization of building. Contacts with a group of engineers and scientists at Columbia University (Technocracy, Inc.); distances himself from Howard Scott and his technocracy movement. Contacts with Diego Rivera and the John Reed Club; distances himself from communism. 1931- 32 Designs a bathroom unit for American Radiator's Pierce foundation that can be industrially produced. RBF reads Albert Einstein's essay "Religion and Science" in The New York Times Magazine, and it impresses him deeply. RBF cashes out his life insurance and purchases the architecture magazine T-Square; renames it Shelter; publishes his own contributions (e.g., the series of articles "Universal Architecture"). Isamu Noguchi creates the sculpture Miss Expanding Universe (December 1931), which is used on the cover of the November 1932 issue of Shelter. After Franklin D. Roosevelt is elected president and the New Deal is introduced, the magazine ceases publication. 1932 Foundation of the Structural Studies Associates (SSA), which RBF along with, among others: Archibald MacLeish, Knud Lonberg-Holm, Frederick Kiesler, Simon Breines. Criticism of International Style. Lecture series for the SSA. Museum of Modern Art rejects and exhibition of the Dymaxion House model. Shows in N.Y.C. and Philadelphia. RBF participates in a project with Simon Breines, in which an office building abandoned during the Depression is converted to shelter for the homeless. 1933-34 With $5000 in cash from the stockbroker Philip Pearson and the enthusiastic support of Pearson's wife, Temple, RBF is able to build the Streamline car published in Shelter. Founding of the 4D Company. March: Construction of the prototype for the Dymaxion Car begins in Bridgeport, Conn., with the ship designer Starling Burgess and a group of former Rolls Royce mechanics. In addition to Fuller, the renowned yacht builder Starling Burgess decisively influences the design. First trip in the completed car in July 1933. First presentation at the Automobile Show in New York. Involvement in a serious accident results in negative headlines for the Dymaxion Car. Dymaxion Car No. 3 is introduced with much publicity at the World's Fair in Chicago (1933-35). RBF meets the writers H.G. Wells and Christopher Morley; the latter will become one of RBF's best friends. Morley writes the essay Streamline: Thoughts in a Dymaxion (1934). February, 1933, Planning commission of the USSR is interested in the Dymaxion House. 1935-36 Collaboration in the construction of the research and development division of Phelps Dodge Corporation, the third largest copper company in the world. Works out the research program and completes statistical and historical analyses and maps on extracting and working strategic metals. 'The results are used by Fortune magazine and the Bureau of Standards in Washington, D.C. Conceptual work on a prefabricated bathroom; production of twelve prototypes of the Dymaxion Bathroom; applied for patent in May 1938. Exhibition of the Dymaxion Bathroom at the U.S. Bureau of Standards (1936-38), NY Museum of Modern Art, etc. 1936, Participates in experimental television broadcasts at the CBS experimental studio, under the direction of Gilbert Seldes. RBF explains to his friend Nogouchi the equation E= mc^2 in a telegram. During the summer works on the manuscript of his first book, Nine Chains to the Moon, which was published in 1938. Meets with Albert Einstein to discuss the manuscript. 1938-40 Technical advisor on the editorial board of Fortune magazine. Collaborates on a series on the topic "The New U.S. Frontier" and on the anniversary edition celebrating ten years of Fortune, with "USA" as the theme and "U.S. Industrialization" as the lead article. 'Advisor to Life magazine. 1939, Unpublished book manuscript: Ballistics of Civilization. 1939, Dymaxion Bathroom is exhibited in a newly opened building for the NY Museum of Modern Art. 1940-42 Untitled Epic Poem of Industrialization: extensive manuscript written in 1940, first published in 1962. Model of the Dymaxion House is destroyed while being transported to Rockefeller Center. Studies commissioned by the industrialist Henry J. Kaiser. Reengineers metal grain bins as shelters: Dymaxion Deployment Unit. Request from the British War Relief Organisation to design emergency shelters for war home-less. A prototype is built by the Butler Manufacturing Company. The design for the Dymaxion Deployment Units is patented.. Because of wartime restrictions on metals, the design is not mass produced.. DDU exhibited in Washington, D.C. (1941). Production of a small series for the Air and Signal Corps; employed in Alaska and Iran. 1942-44 Leading engineer on the Board of Economic Warfare in Washington, later Foreign Economic Administration. Studies on wartime economy, for example, an investigation of the industria-lization of Brazil. Twice weekly lectures on world energy and geography for coworkers in the departments and administrations in Washington. Works out the Dymaxion World Map; in 1940, the world energy map appears in Fortune (February issue); in 1943, first version of the Dymaxion World as a tear-out sheet in Life magazine. Geometric investigations, or preliminary studies to energetic geometry. ( . YPS: Discourse). Sleep experiments (1943) . Lectures in the Cosmos Club, Washington, D.C., for scientists and engineers, on the history of discoveries and inventions (1943). Contact to Vannevar Bush (Office of Scientific Research and Development) and the scientists of the Manhattan Project. Display panel "Profile of the Industrial Revolution" (1943). Publication of an essay on the World Map Fluid Geography (1944) ( YPS: Discourse). First manuscript on energetic geometry (1944). 1947-48 Return to Forest Hills, New York. Two-year period of work on energetic-synergetic geometry. Discovery of Jitterbug" Transformation (March-April 1948). Work on the concept of geodesic domes. Application: true planetarium Your Private Sky (July 1948) . First great-circle model with four-foot diameter. Summer 1948: Failed attempt to construct a prototype with a diameter of fifty feet, together with students at Black Mountain College, North Carolina. First lecture on energetic geometry. RBF befriends Ruth Asawa, John Cage, Merce Cunningham, Josef and Anni Albers, and others. Inspired by RBF's lectures, Kenneth Snelson discovers the principle of multipolar tensegrity structures (1948-49). In the "magic summer" of 1948, the core of a genuinely American form of art develops at Black Mountain College. Meets Konrad Wachsmann, Serge Chermayeff, and Peter Blake in Chicago. Construction of the first Necklace Dome there (collapsible structure, i.e., flexible nodes) with a diameter of fourteen feet. Student projects "Autonomous Package, Autonomous Dwelling." . Teaches regularly at the Institute of Design, Chicago, beginning in September 1948. 1948 summer. Fuller, teaching at Black Mountain College in North Carolina, USA. Fuller and Snelson meet. Snelson told Coplans: "Bucky was... talking of tension and compression... I started to think of something like a swinging pendulum sculpture. The sculpture consisted of a succession of forms: the lower one supporting the upper one and suspended by a girth of thread. It is slung and the sculpture moves like a spinal column; the form is very flexible. I did two or three sculptures like this and then it occurred to me that to remove the mobility would be a curious thing. I would then have these units separated from one another and retained rigidly in space if I tied the strings in a different manner. The only difference is that both compression members are completely free of one another. It has no top, bottom or sides, and could be placed into orbit." 1949 summer. Snelson shows Fuller his first Tensegrity sculpture. 1949-53 Teaching at Institute of Design, Chicago, and the University of Illinois, Champaign. February 1949, Visiting lecturer at Illinois Institute of Technology: energetic geometry. First seminar at North Carolina State College. Construction of Necklace Dome in the Pentagon Garden, Washington, D.C. RBF is dean of the Summer Institute, Black Mountain College; consts the Skybreak Dome with transparent plastic skin. Meets Robert Rauschenberg. Essay: "Total Thinking," 1949. Visiting Critic at M.I.T. Seminars and visiting lectures at Bennington College, University of Michigan, Harvard University, University of Toronto, 1949. Extended lecture tours and teaching in the USA, including North Carolina State University, School of Design. Study project: Automatic cotton factory. Under the of "anticipatory design science," he subsumes a mathematical-structural model theory with a preventative planning and design theory. Anticipation of global environmental problems. Meets Duncan Stewart (1949). Other important collaborators during the years 1949 to 1955 include T.C. Howard, James Fitzgibbon (Synergetics, Inc.), Don Richter, Kenneth Snelson, Jeffrey Lindsay, Shoji Sadao. 1950 December: Construction of the first full-size geodesic structure: a semispherical dome in Montreal with a diameter of forty-nine feet, made of aluminum tubes, each of which weighs one pound. Developed by the Fuller Research Foundation, Canadian Division (Jeffrey Lindsay). Aluminum was still rationed in the USA, and thus was not available to RBF, so he turned to Canada. Unpublished manuscript Noah's Ark 2 ( . YPS: Discourse). 1951 Fuller's first use of the metaphor "Spaceship Earth." Press reports on geodesic domes. NY Museum of Modern Art exhibits a geodesic dome. Patent application (December 1951). 1952 Study project Geoscope, Cornell University, Ithaca, N.Y. Paperboard Dome, Princeton Univer-sity. Elaine de Kooning. Dymaxion Artist ( . YPS: Discourse). RBF meets Shoji Sadao at Cornell University, Ithaca, during the construction of the geodesic globe Geoscope; they collaborate closely from that point on. Meets Thomas T. K. Zung. 1953 Minnesota University. Fuller realization at large scale of a rigid tensegrity structure with 270 non-identical rods. The structure is patented by Fuller later, in 1962. 1953-54 Fulfillment of a commission from Ford Motor Company to build a dome over the corporate headquarters in Dearborn, Michigan; first commercial application of the principle of the geodesic dome on a lightweight metal framework; duration of project: four months from receipt of commission to completion. Hyperbolic-parabolic wood construction for the Geodesic Restaurant in Woods Hole. Massachusetts (G. Peterson). Extensive teaching activity at many universities in the USA, as in subsequent years. First Tensegrity Sphere (1953). 1954 Icosahedron projection of the Dymaxion World Map. Patent awarded for the construction of geodesic domes. Test and acquisition of geodesic domes by the U.S. Marine Corps and Air Force. Development of a dome type without metal for radar stations at the Lincoln Laboratory (in parallel with computer research there). The polyester-fiberglass construction is superior to tires. First Radome installation on Mt. Washington. Production and assembly of Radomes for the DEW line (Distant Early Warning). Grand Prize at the Triennale di Milano for the two Cardboard Domes (corrugated paperboard). Prizes and honors from, among others, the American Institute of Architects, the Marine Corps, Michigan State University, as well as honorary academic degrees; Visiting Professor at the University of Michigan. Lectures on Synergetic Geometry. 1954 Patent: Fuller, R.B. Building construction, U.S. Patent No. 2,682,235, June 29, 1954. 1955 Founding of Synergetics, Inc., Geodesics, Inc., with the goal of exploiting the patent, licensing, and carrying out commissions for industry and the state. 1956 Introduction of transistor devices on the market. State purchases domes for U.S. exhibition pavilions at industrial and trade fairs. First geodesic pavilion for the Miel Continent Jubilee, St. Louis, Missouri. 1957-59 Construction of large geodesic domes for, among others, Kaiser Aluminum and Union Tank Car Company, Baton Rouge, Louisiana. By late 1959, more than one hundred licenses to construct geodesic domes have been awarded on the basis of Fuller's patent rights (5% of sales). Play Domes, climbing frames for playgrounds, are mass produced. Plydomes, domes with plywood panels, are produced commercially. Dome built for Synergetics Inc.'s Society of Metals. Construction of the U.S. pavilion of the American exhibition in Moscow, Sokolniki Park, 1959: geodesic dome, inside the first multivision with film and slide projects by Ray and Charles Eames. Lecture tour though South Africa, Japan, India, England, among other places, and visiting lecturer. Exhibition in the NY Museum of Modern Art in New York (1959). 1958, Invited to England by the Independent Group, Institute of Contemporary Art (Richard Hamilton, John McHale, Peter and Alison Smithson, Reyner Banham, and others). Lecture R.I.B.A., London. 1959, Professorship at the Southern Illinois University, Carbondale; research and teaching at the Department of Design. Participates in first Delos Symposium, organized by Domadis. Memorial speech for Frank Lloyd Wright in Taliesin, Wisconsin. Correspondence with the virus researchers A. Klug and T. Fink on the icosa-geodesic structure of the polio virus. Tensegrity mast is exhibited in the NY Museum of Modern Art. 1959 Oregon University. The first deresonated tensegrity with 270 identical rods. The structure is described in Synergetics as "isotropic tensegrity geodesic sphere: single bonded turbo triangles, forming a complex six frequency triacontahedron tensegrity." 1959 tensegrity displayed at the Museum of Modern Art (MOMA) in New York. Designed and constructed by Shoji Sadao and Edison. 1960 Long Beach State Collete. The realization of a rigid tensegrity structure in bamboo with a diameter of 14m. The outer ends of each element were calibrated with regards to the central point of the adjacent elements. 1960 Project Dome over Manhattan, two miles in diameter. RBF and Anne occupy their home in Carbondale: Home Dome, a geodesic dome of wood, a series model by the Pease Company of Ohio, design by Al Miller. Receives several honorary doctorates. Publication of The Dymaxion World of Buckminster Fuller by Robert Marks. 1961 Patent for Octet Truss granted. Published: Fuller, R.B., “Tensegrity”, Portfolio and Art News Annual, No.4. pp.112- 127, 144, 148. Also available in [] Southern Illinois University. Basket weave tensegrity by Fuller. An interwoven dome of a 22m diameter, 3.4 of a sphere, approximately 15m high. The struts were made of wooden centine, segmented and interwoven, which permitted the cost to be sharply reduced. This geodesic also corresponds to the alternate breakdown of a 4v icosahedron, sectioned to 5/8 of a sphere. 1961 Southern Illinois University. Basket weave tensegrity by Fuller. An interwoven dome of a 22m diameter, 3.4 of a sphere, approximately 15m high. The struts were made of wooden centine, segmented and interwoven, which permitted the cost to be sharply reduced. This geodesic also corresponds to the alternate breakdown of a 4v icosahedron, sectioned to 5/8 of a sphere. 1962 Initiative for a ten-year study program of World Design Science Decade with the support of the Union of International Architects (UIA), runs until 1967. Construction of the research, planning, and coordination center Inventory of World Resources, Human Trends and Needs at Southern Illinois University, in which the motifs of global projects are intended to run together. Executive Director John McHale. His book R. Buckminster Fuller appears in 1962. Tensegrity patent awarded in 1962. Education Automation published (1962). 1962 Meets Marshall McLuhan at Delos Symposium. 1962 Patent: Fuller, R.B., Tensile-Integrity Structures, U.S. Patent No. 3,063,521, November 13, 1962. 1963 Lecture at the Sixth World Congress of the U.I.A. in Mexico City (Mexico Lecture). RBF publishes autobiographical writings and essays under the title Ideas and Integrities; publication of No More Secondhand God. Research project: Advanced Structures Research for NASA. Scholarship for RBF's student Joseph Clinton. 1963-68 RBF advisor to NASA. 1963 RBF is Charles Eliot Norton visiting professor for poetry at Harvard University. 1964 Patent: Fuller, R.B., Suspension Building, U.S. Patent No. 3,139,957, July 7, 1964. 1964 Time magazine dedicates a cover story to RBF; cover by Artzybasheff volume. Series of articles, "Prospects of Humanity" in Saturday Review. BBC television broadcast with RBF, on science program of Channel Two. Participation in the Dartmouth Conference in Leningrad, a meeting between leading personalities of the USA and USSR. Founding of the architectural office Fuller& Sadao. Project Geoscope with John McHale. 1965 Together with John McHale, edits and publishes World Design Science Decade in six volumes over ten years (1965-1975), with lectures by Fuller as well as statistical material, maps, diagrams for an inventory of the planet, its population, sources of raw materials and energy, its industrial use and circulation, and so on. Patent awarded for geodesic Monohex Structures (Fly's Eye Project) and Laminar Domes with folding skin. At Southern Illinois University Fuller inaugurates the project World Game, a computerized display of the world whose concept is modified in a series of variant projects and then later expanded to include project courses and workshops. RBF proposes World Game as the U.S. contribution to the World's Fair in Montreal; rejected by the U.S. Information Agency. Fuller &Sadao, Inc., obtains commission to plan and design the U.S. pavilion for the World's Fair, Expo '67 in Montreal, Canada. Motto: "Creative America." Construction of a geodesic dome as a three-quarter sphere with a diameter of seventy-six meters and a height of sixty-one meters, 1965-1967. 1966 Lectures in Cape Kennedy on transformation and use of the fallout of technology from space travel for an industrialized production of dwellings. Project Yomiuri Tower, tetrahedral tower that is two miles high (not realized). RBF profile by Calvin Tomkins appears in Saturday Review. 1967 Patent: Fuller, R.B., Octahedronal building truss, U.S. Patent No. 3,354,591, November 28, 1967. 1967 The Expo Dome makes Fuller and his geodesic domes world-famous. Jasper John's painting of the Dymaxion World Map is exhibited in the Expo Dome 'Special issue 2000+ of Architectural Design. RBF and Anne celebrate their Golden Anniversary. Purchases sailing yacht Intuition. Fuller interviews printed in American and English underground magazines. Student groups and youth communes build their own geodesic domes. Project Tetra City as floating city with growing tetrahedral structure. Founding of Whole Earth Catalog by Stewart Brand, inspired by RBF. "The insights of Buckminster Fuller initiated the Whole Earth Catalog." -John Cage visits RBF to discuss Cage's manuscript for A Year from Monday. Following a lecture by RBF, the idea to found Drop City (drop-out community) is developed; domes and zomes of junk parts. Christening of ship Intuition. Construction of the Caterpillar Dome in Cleveland (with Thomas 1'. K. Zung). RBF and Norman Foster meet; begin collaborating on many projects. Design for the Samuel-Beckett Theater. 1969 Pilot project studies for World Game at the New York Studio School of Painting and Sculpture with an interdisciplinary group of students. RBF develops the concept of a iglobal electrical circuit.i Project with homeless youth and slum tenants in New York and St. Louis. .June-July: First World Game Seminar (with Ed Schlossberg) at the New York Studio School. Preliminary stage for a computer patent. Consultation with a patent lawyer. Project World Man Center, conference building for Cyprus. Fuller & Sadao (not realized). October: Operating Manual for Spaceship Earth appears as a book, as does Utopia or Oblivion. Nehru Memorial Lecture, New Delhi. Friendship with Indira Gandhi. Fuller nominated for the Nobel Peace Prize. Construction and opening of ecumenical Religious Center in Edwardsville, near St. Louis, Missouri, a building with a concrete pedestal and a geodesic dome, in whose plastic outer surface the outlines of the continents appear. Design by Fuller & Sadao, Inc.
1970 The CIA searches RBF offices in Carbondale on a "fact-finding mission." Fuller is suspected of sympathizing with the rebelious students. RBF's research budget at Southern Illinois University is cut. Research report for NASA prepared by Joseph Clinton: Advanced Structural Design Concepts for Future Space Missions. Book on John Cage by Richard Kostelanetz is dedicated to RBF. October: Meets Ezra Pound in Venice. December: Dome Book (1) appears, edited by Lloyd Kahn. Contains examples of and instructions for geodesic domes; Joe Clinton compiles the data and calculations for the rod measurements. Patent awarded for the catamaran construction Rowing Needle. 1971 NBC television program Buckminster Fuller on Spaceship Earth (R. Snyder). Climatroffice project together with Norman Foster. Old Man River's City project for the renewal of a slum in East St. Louis. Concept: "An Umbrellaed Town" 1970-74. Book Drop City appears (Peter Rabbit, pseudonym). RBF's budgets at Southern Illinois University cut back sharply. RBF finances World Game from his own pocket; Medard Gabel is his collaborator. Special issues of Architectural Forum and Architectural Design on RBF. 1972 Planning of Spaceship Earth at Disney World, geodesic full sphere, main attraction of the Epcot Center. Do-it-yourself dome construction of wood slats and plywood, design Fuller & Sadao, published in Popular Science, a success with the public. Book Intuition is published. With RBF Hans Meyer develops a windmill construction to be mass produced at low cost. RBF is editor of World Magazine. He is offered a position in Philadelphia as World Fellow in Residence. Moves residence and research office to Philadelphia. 1973 RBF criticizes Limits to Growth as Malthusian. Hugh Kenner publishes the book Bucky: A Guided Tour of Buckminster Fuller. Patent for tensegrity dome granted. 1975 January: Two-week-long lecture: Everything I Know is recorded on video: playing time is forty-two hours. Patent awarded for asymmetrical tensegrity construction. RBF receives his first license as an architect, from the State of New York (at the age of seventy-nine). Fuller's magnum opus Synergetics appears as a book (vol. 1), collaborator E.J. Applewhite. RBF professor emeritus at Southern Illinois University and University of Pennsylvania. Project Fly's Eye, Fuller's last design for an industrially produced dwelling at low cost; geodesic dome of standard shell elements, round openings are left out, monohex principle. 1975 Patent: Fuller, R.B., Non-symmetrical tensegrity, U.S. Patent No. 3,866,366, February 18, 1975. 1976 Hugh Kenner, Geodesic Math and How to Use It. Synergetics exhibition for the opening of the Smithsonian/Cooper-Hewitt Museum of Design. RBF publishes book And It Came to Pass- Not to Stay. Tetrascroll published as artist's book in limited edition by Tatyana Grosman's U.L.A.E. August: Unpublished manuscript: Sense of Significance: A Memoir of Friendship, dedicated to the friendship between the poet Christopher Morley and RBF, written by Louise Cochran, Morley's daughter. 1979 Second volume of Synergetics is published (collaborator: E.J. Applewhite). Project RBF/ N. Foster: International Energy Exhibition, Knoxville, USA. Arthur L. Loeb teaches geometry to design students at Harvard University on the basis of RBF's Synergetics. World Game Laboratory founded. Medard Gabel publishes the books Ho-Ping: Food for Everyone, 1979, and Energy, Earth, and Everyone, 1980. Foundation of the architectural office of Fuller, Sadao &Zung (Cleveland, Ohio). 1980 New edition of the Dymaxion World Map by R. Grip, C. Kitrick. Moves residence from Philadelphia to Pacific Palisades, California. 1982 Fuller/Foster: Project Autonomous House, a project for Fuller himself. Double shell, the idea of the Garden of Eden. Disney World Epcot Center with geodesic sphere Spaceship Earth opens. 23 February: Fuller is awarded the U.S. Medal of Freedom by President Reagan. 1983 Death of Buckminster Fuller from a heart attack, 1 July 1983. His wife, Anne Hewlett, dies just two days later, on 3 July 1983. 1910f: Bucky hears mention of Great Aunt Margaret, but little details are provided, during his childhood. 1920: Bucky clips Hall of Fame portrait of Margaret from New York Tribune May 2, 1920, writes in pencil, "My Great Aunt." 1921: Bucky clips book review mentioning Margaret Fuller's father as a self-made man. New York Tribune February 19, 1921. 1925c: Bucky saves Margaret Fuller House report and donation solicitation in his scrapbook*. 1926: Bucky clips cartoon of Carlyle meeting Margaret Fuller, from the New York Times Book Review August 15, 1926. 1928: Bucky reads Margaret Fuller's accounts of her personal identity crisis, in Margaret Fuller and Goethe by Braun, her Memoirs, or both. 1963: Bucky publishes an excerpt of Margaret Fuller's writings in his 2nd major book, "Ideas and Integrities"
For more details on Margaret's influence on RBF, see here. Fuller active in Stockade, the company he formed with his father-in-law, James Monroe Hewlett. Fuller was President of their company, the Stockade Building System. By 1926 had created four or five small factories and 240 small residences in the eastern United States. Stockade is seen as a modern technology and is featured in the The American Architect 50th anniversary issue. a new individualistic American music, Jazz, played by Jelly Roll Morton, Louis Armstrong, and other African Americans, part of a huge northward migration from the troubled South. new personal freedoms exemplified by the "Flapper," a young woman who drinks, smokes, dances to Jazz, wears short hemlines and short hair, and in general is exploring new gender roles. a sense of lawlessness as people drink in spite of Prohibition and Al Capone in this period strengthens his hold on Chicago. a sense of empowerment-via-publicity, as a series of sensational Chicago women murderers are released by juries, although guilty; these events are portrayed in the long-running Broadway musical, "Chicago." record breaking achievements, such as a baseball hero, Babe Ruth, thrilling the nation with an unprecedented home run streak that would remain unbroken for decades, flagpole sitters, and brave airplane pilots setting records (or dying while trying), daily. Hewlett, who founded Stockade with Fuller, informs RBF that he needs $5,000 (over $60K in today's dollars) and will sell. This triggers part of the Stockade crisis. Hewlett will sell another tranche a year later, in September 1927. 7-Oct-26 First board meeting of Stockade Midwest; RBF is reprimanded. The exact nature of the reprimand is not recorded. A reorganization is decided upon. The Stockade Building Systems will become a holding company exercising national promotion and patent protection features along most conservative lines... with headquarters in Chicago. 19-Oct-26 Fales to RBF Oct 19, 1926, 12 days after board meeting: unhappy with Fuller's communication. "I think you ought to let your Board know what you are doing." 19-Oct-26 RBF writes to Hoffman concerned about reprimand that he received. 14-Nov-26 Fourth death anniversary of Alexandra Willets Fuller. 15-Nov-26 RBF nervously writes Sam Hoffman that he does not want to make any mistakes; he needs the board's support. 16-Nov-26 RBF receives Stockade reorganization notice. 17-Nov-26 Minutes of special meeting of the board of directors of the Stockade Building System Inc reorg. are published. Much ongoing correspondence about Stockade difficulties is reflected in RBF's scrapbook. 1-Jan-27 Hewlett to RBF, citing problems that Fuller brought upon himself in Stockade. "I think you realize how slow I should be to attribute to you any but honorable intentions but I don't think you realize how impossible it is to get along with one's friends and business associates on any basis but one of perfect truth and frankness and you have in your anxiety to help forward perfectly proper accomplishment been too ready to adopt what must seem to anyone on the outside as sticky method." 24-Jan-27 First annual meeting stockholders in Stockade Midwest Corporation held. RBF has over 187 shares and is elected to the board of directors. 25-Jan-27 RBF signed lease to rent monthly office, but did not honor the contract; probably not earning enough. Anne finds she is pregnant for the second time. 10-Feb-27 RBF to Stockade Building System: RBF resigns Stockade, remains president of Midwest. 16-Feb-27 RBF to McCarty: reassuring him, Stockade will continue to be OK after "apparent change of command" 17-Feb-27 Andy King (Cousin) to RBF telegram: Wish you success, keep your temper, you head and your confidence. 21-Feb-27 RBF has a bounced check, may reflect financial difficulties building. 28-Feb-27 Telegram AHF to RBF, "terribly worried your not telephoning Saturday" 28-Feb-27 Hoffman to RBF: "in the meantime you have been able to straighten out the matter so as to give you, at least, some additional time." 7-Apr-27 Sam to RBF: attempt made by Kingsbury to force the Stockade Building System into the hands of a receiver. 1-May-27 RBF and AHF begin long separation and will not be together again until August. Their letters frequently cite the high cost of frequent long distance telephone calls, and they often trade telegrams. 14-May-27 Letter AHF to RBF "Oh darling why can't things go decently for us. Probably they will soon. It's just that everything's seemed to pile down on us this year starting with Farley's skunky trick but that wasn't very long ago and we were awfully happy last fall so perhaps we'll be awfully happy again very soon and it won't have been so bad.... I've been feeling alrightish lately but I'm getting to look awfully big which is very sad." (last part added in pencil; Anne is six months pregnant.) 14-May-27 Clipping, Fire Protection of Bus Garages, Electric Railway Journal. . Pencil notation- "Suggest you pass this to…" (Busses will be an important example to Fuller of prefabricated shelter.) 20-May-27 Charles Augustus Lindbergh makes his prize-winning solo nonstop flight from New York's Long Island to Paris, France, a distance of nearly 3,600 statute miles (5,800 km), in the single-seat, single-engine purpose-built Ryan monoplane Spirit of St. Louis. As a result of this flight, Lindbergh was the first person in history to be in New York one day and Paris the next. (The flight was a great inspiration to RBF and he cites it in his first presentations that were to place in St. Louis in 1928.) 28-May-27 RBF to Albert MacCarthy: I am no longer connected with the Stockade Building System, Inc. in New York other than as a stockholder and director, but am not very close to its affairs. Patents are issued to Hewlett & RBF for Stockade related items; A foreclosure suit is discussed against Stockade. Henry Ford from June to December 1927 galvanizes the American imagination with his launch of the Model A. It was hailed as a triumphant revival, even rebirth, of his Ford Motor Company. In the same period Ford settled the embarassing libel suit against him. He printed apologies for his anti-semitism and ceased publishing such material in his newspapers. More Stockade patents awarded to RBF. 13-Jul-27 AHF to RBF: "We can live on these small inheritances and trust payments if necessary." Anne indicated that they might live on her small inheritance and trust money, but instead she gives it to her brothers to manage instead, an act that stung RBF, who considered it to be a selfish betrayal. 13-Jul-27 AHF to RBF: "What does old skunk Farley say about your expense acct.? I was wild when I heard the 1,000 was from your stock & not the account money at all. You are going to get that paid aren't you darling?... I guess with Geo. Cross around you can fix things so that Farley can't do any nasty tricks while you're away." ($1,000 in 1927 is $13,000 in today's money; Fuller was in a real financial crisis by this point.) 21-Jul-27 AHF to RBF: (Planning her arrival in Chicago). "I think your idea about living at the Virginia is the best; during the hot weather and all we wouldn’t want to struggle over getting settled and cooking etc." Anne knows Fuller's problems with Hopkins as well as Stockade Midwest's reluctance to reimburse his expenses. But Fuller will greet her in one of the finest hotels in Chicago. 23-Jul-27 Acoustic test results of Stockade walls are delivered. 4D company is mentioned as a fully formed idea in RBF's scrapbook. 7-Aug-27 Balance sheet, shows good financial trend when he took Anne to Chicago, had half a million 2007 dollars, and Fuller expected that his hard work had built the foundation for a secure future. However, all this paper value evaporates over the next month. 7-Aug-27 AHF begins her diary, starting August 7th ending 14 Dec 1928, that reveals much rich information about the period. Though the diary begins on her arrival, neither she nor RBF make any further entries until November, where "Fuller Houses" is cited as an already formed idea under discussion. 15-Aug-27 The first of eight Virginia Hotel receipts is paid and stored in the scrapbook. 28-Aug-27 A second daughter is born to the couple and named "Allegra." This birth is experienced by RBF and Anne as a rebirth. Her name is alliteratively similar to "Alexandra", both names begin with short "ALLE", end in short "RA," and feature a hard consonant between. RBF highly identifies with the baby's birth, to the extent that he prints his own fingerprints next to the baby's footprints. In celebrating the baby's arrival, RBF makes his first mention of the company he has been considering, named "4D." The 4D name is a play on two of Fuller's main inspirations: fourth dimensional geometries of Einstein and Bragdon, and the industrial production of Henry Ford. The name 4D is based on FORD. RBF writes, "WHEREAS the 4D Company is soon to outgiant the collosus of Detroit, having economically cut corners around it, even to a 50% reduction in the quantity of letters necessary to the indication of its name, and material stabilization of that quantity, by removal of its doubtful 'or' ...." Fuller's citation of Ford is done during Ford's dramatic rebirth and recovery of the automobile market through his release of the model A. Even as the proud new parents celebrate the birth (or re-birth) of their daughter, RBF realizes he will not get any more money or value out of Stockade. 9-Sep-27 The first of two nurses are employed by the Fullers. 14-Sep-27 AHF to her father (rare typed letter): "I really am very much impressed with Chicago this time. Its so beautifully kept up in this section and everyone seems to be working so hard to make it more beautiful and efficient and finer in every way.... Bucky is awfully busy with his business and his family but he seems as happy as a King and simply adores the baby. We really can't believe we've actually got a little girl. I was so sure it would be a boy and we were awfully depressed about it." 27-Sep-27 Hewlett informs RBF he intends to sell some more Stockade stock (one year after his sale in Sept. 1926), or use it as collateral for a loan. He lobbies RBF to find a good buyer: "I should like it to get into the hands of someone who would back you up, so that it the reason why I am suggesting that you find someone out in Chicago that would take up a proposition of this kind." The October diary does not have day-to-day information like it will from November forward. Fuller is beaten and robbed, and would have recuperated this month. A part time nurse is working with the Fullers. The nurses complete their work by 9 November. RBF saves a pamphlet from church in his scrapbook, "What is it to believe in Christ?" He is attending church most Sundays and his diary often notes that following services he enjoys a long walk back to his hotel room. The pamphlet and RBF's regular church attendance during this period may be indications of Fuller attempting to deal with the crisis he is undergoing. Church pamphlets are rare in Fuller's archives; there is only one other known, dating from 1922. 1-Nov-27 Chamberlain to RBF, Chamberlain patents would pose a conflict as he is a Stockade employee. 1-Nov-27 Stockade thanks RBF in a letter, made $1K net and sales were starting to exceed production. 3-Nov-27 RBF notes in his diary, "RBF out of Stockade" 14-Nov-27 RBF notes in his diary, Allegra is making her first sounds with her mouth. (RBF is highly identifying with his newborn daughter, and will speak later of mumbling and making sounds himself. This notation is made on the fifth death anniversary of Alexandra) 21-Nov-27 AHF notes in her diary, "Bucky saw Mr. Stedman - first vice president of the Celotex Company. They had a good talk & we are quite hopeful. He will let Bucky know definitely tomorrow." (RBF does not end up getting the job.) 22-Nov-27 AHF: "RBF Got Job - Waukegan." Franklyn Muller Asbestone floors offers RBF to represent the Waukegan, WI company in Chicago. 22-Nov-27 Fuller Houses appears in the diary as a completely formulated idea; Fuller must have been working on it while at Stockade. Diary entry: "Bucky… saw Intratiane (old Stockade salesman) and talked about 'Fuller Houses.'" 23-Nov-27 RBF takes Muller job, as Cellotex job did not materialize. AHF in diary: "Celotex called - Neil Ryan had no job, very friendly tho & offered his own or company's help. Said when plan finished see him re financing. Letter came from Mr. Smythe at Waukegan giving Bucky that job a only $50 per week with commissions. Quite a relief to us. Bucky went to Joliet, ran into Farley at Tomlinson's - as usual most disagreeable. Tomlinson spent afternoon with Bucky conferring on 'Fuller Houses.' Simply thrilled with whole scheme. Bucky spoke to Marti who is getting sick of Farely's cussing out Bucky. Farley told him not to let RBF in plant. He was wild at the thought of Celotex taking RBF on. Marti very interested to know about RBF's 'Fuller House' plan. Talk with Geo Cross on tel. in evening after Bucky got home at 10:30." 1-Dec-27 RBF is seeking a new hotel that is cheaper than the Virginia. He begins to keep a detailed budget. A typical day includes newspaper, food and a movie. 4-Dec-27 CHURCH AHF: "Bucky went to church. Very inspiring sermon at St. Chrysostom's. Then looked at apartments as we must move." 4-Dec-27 RBF pays for a speaking course and begins practicing speaking at home. His diary will now often speak of his practicing oration. 5-Dec-27 RBF: "Moved from Virginia to Hotel Lake View. Anne pretty much upset." Anne finds Lake View "small & frightful." This negative experience, from the luxurious Virginia to a single room, was a trauma that was re-told later by Bucky as "moving to a tenement." Note that the building was a new apartment hotel in a good neighborhood. 6-Dec-27 Diary, "AHF got very sad again. " 8-Dec-27 AHF: "We moved into sunnier room." They would move again six months later to a much larger apartment with a view. 11-Dec-27 After Church, AHF and RBF see Emil Janneys in "The Way of All Flesh." Emil Jannings won the Oscar for that film, in which the main character is a failure, poor and destitute. 13-Dec-27 RBF practices public speaking for Hewlett his father-in-law, who is on a rare visit to Chicago. 17-Dec-27 RBF to Rasin: I am no longer connected with the Stockade Building System, but am with its subsidiary Stockade Midwest Corporation… Stockade Building System passed into the hands of Farley Hopkins 20-Dec-27 RBF: Savings account started. 25-Dec-27 RBF describes their Lake View Hotel apartment hotel as "a small, clean, safe place… a one-room flat in a new fire-proof apartment building at Clark and Belmont, at $22 a month." In 2007 dollars that would be about $270. Fuller is still selling Muller floors, but his diary reflects a building stream of highly excited, intense and strenuous intellectual activity. Fuller often cites God, talks about changing how he eats and acts, and in general shows signs of a transformation that is taking a deepening hold on him. Fuller will say later that, in 1927, he was considering suicide, but heard voices and other unusual activity that convinced him to focus on his ideas and their implementation, no matter what the cost. 1-Jan-28 4D calendar drawn up. Sending letters about 4D houses. 3-Jan-28 RBF: RBF buys a typewriter on payments. 9-Jan-28 RBF to Alfred Fuller, Chicago is "a 'hard boiled' business section of the country [that].. Is at the same time pretty much the center of the building and building material world." 10-Jan-28 RBF to Mac, set up Stockade Joliet plant, produced blocks that people later praised in testimonials 14-Jan-28 AHF: RBF giving dictation re: Fuller House plan. 15-Jan-28 AHF: "Bucky practiced oration" 17-Jan-28 AHF: "RBF deep in study." 20-Jan-28 "AHF: Bucky saw Samuel Halstead (cousin of Lawrence's) re Colley. Sounding him out for Fuller business." 21-Jan-28 AHF: "RBF... got drawing board & materials & about midnight closeted himself in the kitchenette & worked until 5:30 am on Fuller House plans." 26-Jan-28 RBF appointment with Mr. Janey, patent attorney. Discussed Stockade patents and Fuller Houses. 29-Jan-28 RBF notes in diary, "Slept too late to got to church. Read Sunday paper in bed. Up and took long run around Belmont Harbor Park." He is now running daily. 30-Jan-28 RBF notes in diary, "read Le Corbusier until very late at night. Startled at coincidence of results arrived at in comparison to Fuller Houses but misses main philosophy of home as against house." This is Corbusier’s 1923 Vers Une Architecture. According to diary 30-Jan borrowed book, 1-Feb returned it. While still selling Muller floors, Fuller discovers this the diary of an ancestor, Margaret Fuller, that articulates the personal identity crisis that he has undergone" "I saw how long it must be before the soul can learn to act under these limitations of time and space, and human nature; but I saw, also, that it MUST do it,--that it must make all this false true,--and sow new and immortal plants in the garden of God, before it could return again. I saw there was no self; that selfishness was all folly, and the result of circumstance; that it was only because I thought self real that I suffered; that I had only to live in the idea of the ALL, and all was mine." For details on Margaret Fuller, see quotes from Marshall's biography of her, here. 9-Feb-28 AHF notes in diary, RBF is at the library looking up Fuller stuff. This is probably when he discovers "Margaret Fuller and Goethe" by Braun. He draws a sketch about Lightful Houses showing baby Allegra, Church (God), love and sun. He writes on it, "Spirit house. The new tool! Metal! Fibre stress. Stem based compression, etc. Utilizing dynamics and tensile strength. Gravity. Self truing or plumbing. Wire rope." Tensegrity researchers will note this focus, from the start, on disassociating tension and compression in new, modern ways. 17-Feb-28 AHF notes in diary some gangster activity, the "assault on Capt. Hart & capture of man who did it." 19-Feb-28 Budget notes, Fuller House Exp $3.00. This is the first of many similar notations. 20-Feb-28 RBF: "Stoddard and I walked up to the Drake to discuss Fuller Houses. He much taken with the whole idea and its philosophy. Glad to hear me say that god was the basis of the plan." 21-Feb-28 RBF: "Read Corbusier. Read diary of Timothy Fuller." (Not clear if this is his great-great-grandfather or his great-grandfather.) 23-Feb-28 Fuller works day and night on his ideas. He writes, "Ate no lunch, plan to give it up for lent & if it works well, permanently. RBF worked on Fuller Houses corporation book and chart all evening working out fields of utility and procedure of various departments. Worked out architectural dept. Had long discussion with Anne on the philosophy of the business end, the business side. The deals of the business world or rather lack of it. Bought cold cream, Sat. Eve. Post, House Beautiful. To bed 3 a.m. RBF received letter & stock certificate for 100 shares S.B.S from Sam Hoffman." 25-Feb-28 Diary: "Started keeping front page of Chicago Tribune for diary of outstanding events, weather, etc. for comparisons with diary. Most important event by the way was news of electromagnetic motor being tested in Detroit by Lindberg & others.... RBF discussed Fuller Houses with Mr. Macleod who was much impressed with this logic. He is a possibility for sales, etc. in Fuller House organization. " 28-Feb-28 RBF notes in his diary, he needs lawyers to help on Stockade matters. The legal matters are not spelled out, though stock settlements are discussed and the issue fades from the diary by end 1928. Selling Muller floors for the last month: this task is not mentioned again, but no particular stopping date is noted either. 4-Mar-28 RBF draws Allegra's profile alongside his own, the second of three renderings at birth, this date at six months old, and finally at ten months old. By drawing Allegra and his own limbs, Fuller demonstrates continuing self-identification with his developing infant--she is unfolding into the world and he is as well. This association with his daughter's rebirth--along with the rebirth of his hero Henry Ford--as well as his ongoing oration lessons, helps explain his later reports of experiencing the world completely anew, to the extent that he even had to re-learn how to talk. 19-Mar-28 RBF: "Saw Dave Taber &. discussed Stockade further. Hopkins demanded settle by Thursday." 19-Mar-28 Hewlett to RBF: "You have not merely done something absolutely improper but you have put him in the position of having his loyalty to you endager his position with Hopkins." 21-Mar-28 RBF: "RBF out to sell stock & p[...]] to make settlement but Taber informed him that Hopkins would accept his stock." 24-Mar-28 RBF: "Wrote & sketched in the park.... RBF down to see Hinkley in R. Walcott's office and finished drawings for patent attorney." 25-Mar-28 RBF: "RBF to church and to Art Institute. Walked home. Took out baby in afternoon & Anne to Art Institute. Spent evening both sketching and RBF reading out loud philosophy of Henry Ford, etc." 27-Mar-28 RBF: "...afraid of market crash. Discussed Fuller Houses with Mr. Douglas and he said he would like to put money in it." RBF has read Margaret Fuller's diary by this time. No direct indication of this is recorded in the diaries or scrapbook, but in May he will discuss it repeatedly and excitedly. 1-Apr-28 Draft of Speech Talk for May 1928 AIA Convention. Fuller relies upon a combination of prayer, criticism, and recent events. He renders drawings of round tubular metal casings, bags of gas filled under high pressure, piano steel wire forming floors over pneumatic struts, wire floors to be covered with pneumatic bladders and fabricoid carpet. A tripod pneumatic building unit mast, a triangular arrangement of spheroidal pneumatic pressure and metallic tension with wire tension supports. The basic ingredients of tensegrity are present, but will require two decades before they emerge in 'floating compression' form. 3-May-28 RBF to his mother: "I have been reading much of and by Margaret Fuller lately. I am astounded to find that same things I have been writing myself are about identical to things I find in her writings. I am terribly interested and am astounded further that I should have grown to this age and never have read anything of her or grandfather Fuller's. His writing is excellent. It seems funny to find Ossoli clubs out here with people studying her and idolizing her and my not knowing of her except by name and as a relation to be proud of, but without knowledge as to why. I think Rosy would enjoy very much reading her books, and about her. All the libraries have her books. You will probably think me a dummy always as the books were always in the Milton house, but I seem just to have grown up to the point where I wanted naturally to read them, in fact am reading a great deal of everything. I have written a long essay on what is wrong in the building business and what should be done about it, etc.... " 17-May-28 American Institute of Architects (AIA) St. Louis, Missouri meeting; RBF discusses and distributes 4D Time Lock with anyone who will listen. He is denied a formal setting. 21-May-28 Following the AIA meeting RBF writes a manuscript, "4D Time Lock," and quotes Margaret Fuller from her Woman in the Nineteenth Century at length regarding intuition. "As a closing admonition to this chapter on the proposed industrial projection of the combined arts in architecture for the birth of a new world culture; there is most applicable the philosophy of Margaret Fuller, Marchessa d'Oosoli, critic and inspirational mentor of American literature, quoting from her Woman in the Nineteenth Century, 'What I mean by the Muse is that unimpeded clearness of the intuitive powers, which a perfectly truthful adherence to every admonition of the higher instincts would bring to a finely organized human being--Should these faculties have free play, I believe they will open new, deeper and purer sources of joyous inspiration than have yet refreshed the earth. Let us be wise and not impede the soul.'" -- Chapter 10, The Revolution in Design. The Industrial ARTS vs Selfish Creation. The New Scale and the Time dimension. 28-May-28 RBF mails his 4D memeographed book to friends, acquaintances and influential people. 4-Jun-28 Hewlitt writes about the AIA meeting, "I read your pamphlet very carefully." His lack of citation of any presentation at St. Louis is significant evidence that Fuller did not present there in any public forum. 12-Jun-28 RBF writes to his sister Rosy, "I have been absolutely astounded at the significance of Margaret Fuller which none of us (present generation of our family) have realized, and upon which I have more or less stumbled at this distant point from home… The Library here has many books about her being published from time to time by Philosophy professors...."
1-Jul-28 Move to 426 Belmont Harbor Apartment, 11th floor apartment 1006. Fuller takes and develops a photo of the view from his window. 8-Jul-28 RBF renders his apartment architectural plan:4 rooms with closets: Foyer, bedroom, living room, dinette and kitchen. It features a service and passenger elevator. NW, there is a view of Yacht Harbor, NE a view of Yacht Harbor, Lake Michigan and Lincoln Park; SE from the private bath a view of Belmont Ave. This is a fine apartment and far from a tenement. 9-Jul-28 Hewlett to RBF July 9 1928: returning some of the materials as he has not enough time to read them; your idea needs more work 16-Jul-28 RBF to his mother, "Houses will be in production in under 3 years." RBF continues to follow up on the 4D Timelock material. 31-Aug-28 RBF to Buffington: "[I]] lost control in the bosom of an ethics fog." This reference indicates his own role in the earlier Stockade troubles. The diary ends 14 Dec 1928. RBF works with design students in Chicago. Constructs the second 4D House model. Two-week exhibition of the 4D House in the Marshall Field Department Store, Chicago. Creation of the "Dymaxion" word and concept by the Marshall Field advertising staff. RBF holds six half-hour lectures daily. Exhibition at the Harvard Society of Contemporary Art, Cambridge, Mass., then at several locations in Chicago and New York. Spends the summer on Bear Island and buys the motorboat Lady Anne. Publishes of the Dymaxion House in Architecture (Charles Scribner, N.Y.C.). The publisher plans a book on the Dymaxion House, for which a Fuller lecture is scheduled in July and recorded by a stenographer; the book was not published. By the close of 1928, Fuller was firmly set on his new path, marketing a new house concept, producing models and prototypes and speaking about the philosophy behind the execution. This pattern of "philosophy mechanically applied" would sustain him throughout his long career. He had, in Loretta Lorance's words, truly "become Bucky Fuller." Fox Movie Tone, news reel shows RBF with models of the Dymaxion House. The family moves to Long Island, N.Y.
RBF remains in New York City. Meets the Japanese-American sculptor Isamu Noguchi, a student of Brancusi. Noguchi becomes one of RBF's closest friends. Noguchi makes a portrait bust of RBF in chromed bronze. Active in the Greenwich Village scene of artists and intellectuals. In November, gives a series of lectures in Romany Marie's Tavern, Greenwich Village, N.Y.C. ; RBF designs the interior for Romany Marie's. In December, exhibits the Dymaxion House model in the studio of Isamu Noguchi. Exhibition and lecture by RBF in the studio of Dorothy Moise, N.Y.C. This page was last edited on 24 November 2018, at 10:43.